Increased pressure felt in NHS hospitals during this summer’s heatwave will have a knock-on effect for patient care this winter, the RCN has warned. 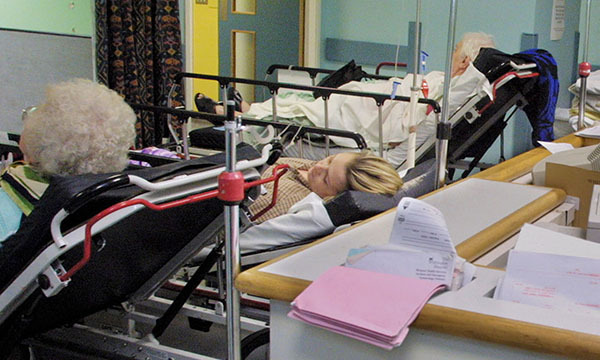 A new report from the college reveals that trolley waits in the NHS in England have more than doubled in the past five-years. It says that during this summer, in which England experienced record-breaking temperatures in June and July, RCN members reported increased numbers of patients attending emergency departments and GP surgeries with heat-related problems. Furthermore, the number of patients waiting more than four hours for a hospital bed after the decision to admit them from the emergency department in the summer months has increased by 137% since 2014, the report says. It adds that many common long-term conditions, such as diabetes and heart, respiratory and renal problems, are exacerbated by high temperatures, with older and socially isolated people most at risk. RCN acting chief executive Dame Donna Kinnair said: ‘We’ve all sadly become used to seeing TV images of patients waiting on trolleys in corridors in the winter months. But what our analysis demonstrates is that trolley waits have now become a summer problem too. The RCN report says successive governments in England have failed to make funding decisions for health and social care services ‘based on a robust, transparent assessment of population need’. ‘This means that local decision-makers are faced with impossible choices, and members of the public requiring support from health services or social care do not have their needs met,’ the report says. 'During the winter, admissions to hospitals increase, placing additional pressures on already stretched services. In turn, this then places more pressure on other services, particularly general practice, urgent care and accident and emergency services. The authors point out that since 2010, numbers of district nurses have fallen by more than 40% and says there are not enough registered nurses and healthcare support workers to deliver safe care.